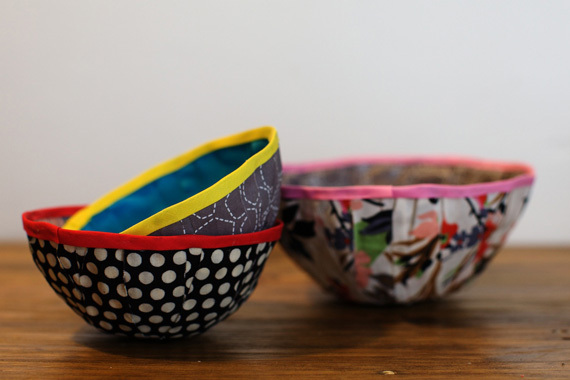 These pretty fabric bowls are perfect for holding keys at home or favors for your next party. They would be an adorable take on an Easter basket filled with goodies this spring, or a nice gift for mom filled with a few sweet trinkets for Mother’s Day. Any coordinating mix of fabric will work for the bowls which makes each one unique. The bowls have quite a few steps but are super easy to put together. You can make a stack of them assembly line style in a very short time! 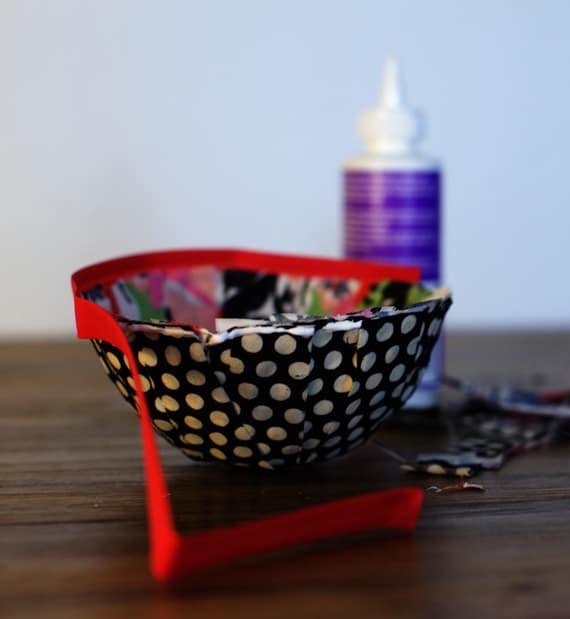 You will need; a variety of fabric strips cut about 1” wide and long enough to cover the bottom of your bowls, an assortment of different size bowls, plastic wrap, pre-made fabric binding, Mod Podge, tacky glue and scissors. To make the bowls, mix equal parts Mod Podge and water and cover the bottom of one of your bowls with plastic wrap. 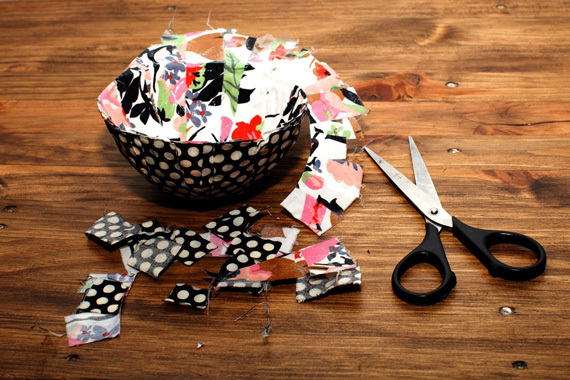 Pick one fabric for the inside of your finished bowl and one fabric for the outside. 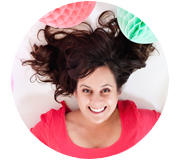 Try using coordinating patterns! Soak fabric strips for the inside color of your bowl in the Mod Podge mixture for a few minutes. Place the first strip over the bottom of the plastic wrap covered plastic bowl. Make sure to place the RIGHT side of the fabric DOWN. Continue placing the strips all around the bottom of the bowl until it’s completely covered. 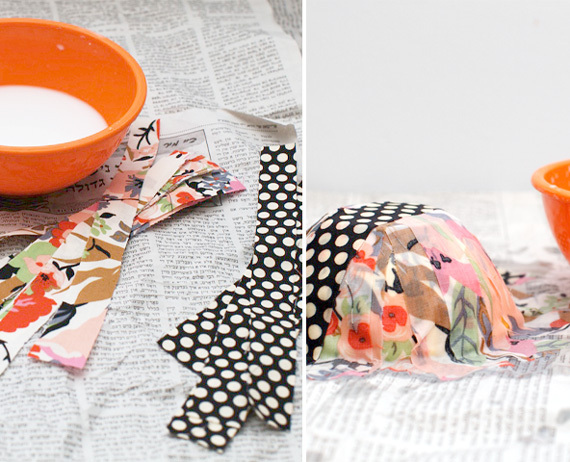 Soak the fabric strips for the outside of your bowl in the mod podge mixture for a few minutes. Place these strips over the first color with the RIGHT side of the fabric UP. Continue overlapping strips of fabric. When the whole bowl is covered, let dry overnight. Gather your scissors, tacky glue, and fabric binding. Cut all of the selvage off of the edge of your new bowl, creating an even edge and even it out a bit if necessary. Cut a strip of binding long enough to edge your whole bowl. Starting at one end of the binding, adhere the inside edge of the binding to the outside edge of the bowl. Continue all the way around. Place a line of tacky glue right at the top edge of the inside of the bowl. Fold the binding over to the inside of the bowl. Glue and fold all the way around. Project styling by Michelle Edgemont Photography by Amber Marlow Photography for Styled. magazine. What a lovely and festive idea! I’m going to make some for my bookshelf. Thank you for sharing! LOVE this idea! So cute. Thanks so much for sharing! Very cool but are they food-safe? Like for a candy dish? Do I remove the original bowl before pasting on the outside fabric strips or does the hard bowl stay in? Thanks. What kind of modge podge do you use for this project ?